From the moment that motorbike touched down on Privet Drive and he wept about leaving Harry behind, we loved Hagrid. Through all the years at Hogwarts, he was the comforter, cheerleader, and defender of the Trio. It wouldn't have been Hogwarts without Hagrid. 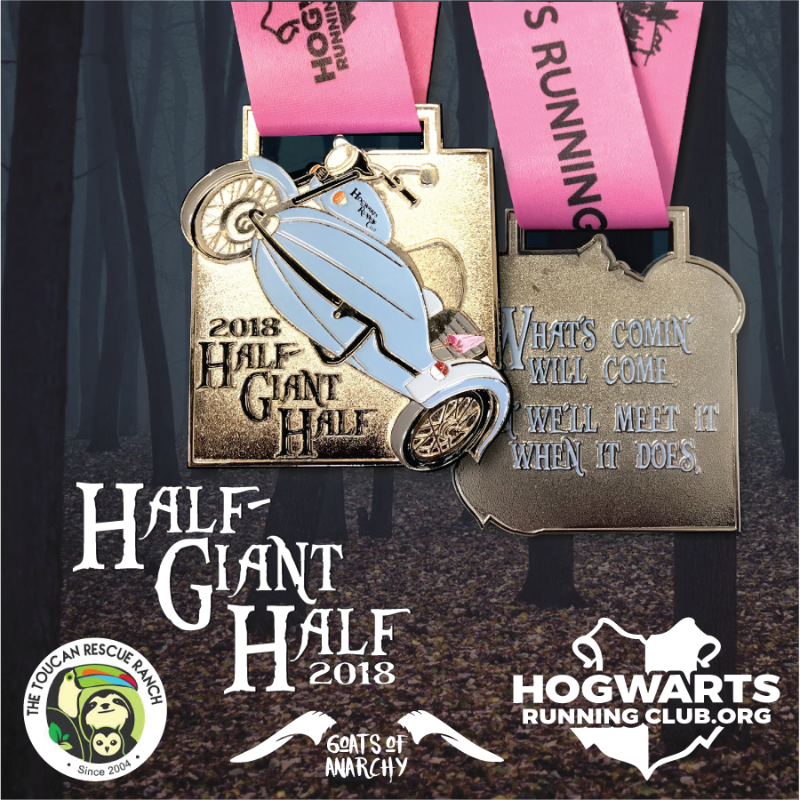 For our fourth event of the year, we are celebrating our favorite half giant with an awesome 3" motorbike medal (pink umbrella included! ), a beautiful sublimated ribbon featuring several magical creatures, and Hagrid-themed digital bib! 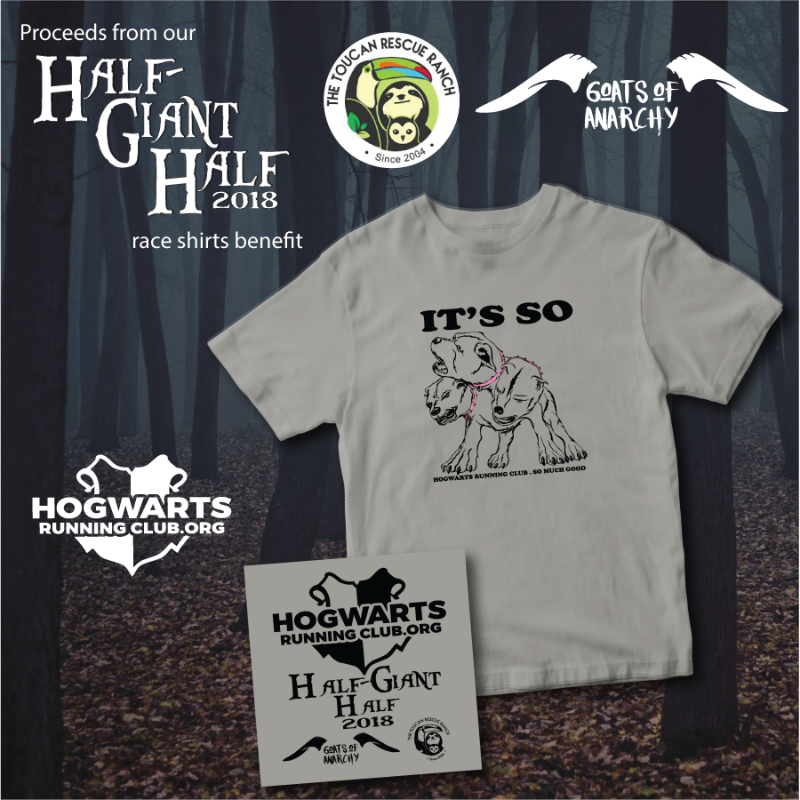 If we're going to have a Hagrid-themed event, we better take care of some magical creatures! But with all of the wonderful animal related charities in the world, how do we decide which one to support? The Headmaster has always said his patronus is a sloth, so he wanted to support sloth rescue. Meanwhile, #Bosswitch has a certain well-known love for magical porch goats. So, instead of choosing, we're doing BOTH! We are pleased to announce that this event will support TWO incredible charity partners: Toucan Rescue Ranch and Goats of Anarchy! Goats of Anarchy (GOA) is the passion of Leanne Lauricella who left behind a successful career in New York City and has now created a sanctuary for goats with special needs, teaching the world acceptance and inclusion and inspiring others to "fight like a goat"! Specifically, HRC will be funding critical fencing and other important infrastructure improvements at GOA's new facility in New Jersey. Visit https://goatsofanarchy.com/ to learn more (and see pictures of super-cute goats!). The suggested run date for the Half Giant Half Marathon is Saturday, July 7th. Remember, this is only a fun suggestion. You are welcome to complete your 13.1 miles whenever you want (or just save the last bit for the run day if you want to break up the distance)! Registration closes at midnight on July 8th (or early morning on the 9th depending on your Time Zone). All medals will be mailed on Monday, July 16th. Sign up today and help support some magical creatures!